Today is the feast day of St Clare, the founder of the Poor Clares and patron saint of radio and television broadcasters. It is also the day on which the community of Cistercian sisters at Whitland celebrate the Golden Anniversary of one of their community. 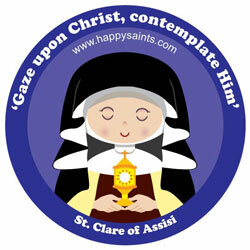 For more information on St Clare, here’s the Wiki page. This entry was posted in Prayer and tagged Patrons, Prayer, St Clare, Television, Whitland on August 11, 2014 by stdavidandstpatrick.